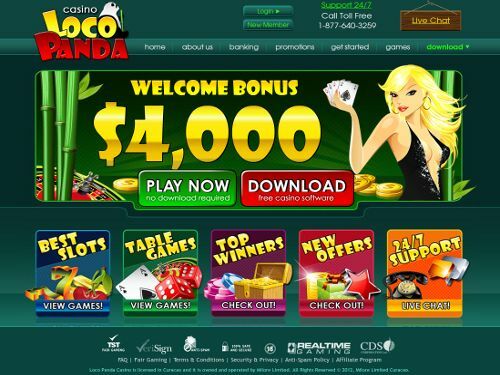 Let’s begin by saying that overall Loco Panda is a great casino—it has pretty much everything that we look for in an online gambling site: great games & graphics, top security, and helpful customer support. But if there’s one thing that we want to really highlight about the casino, it’s the uniqueness. Loco Panda has the look and feel of a social networking site; it’s clean, fresh, and easy to navigate. It’s nice to see that not every casino has to be a carbon copy of another. So if you’re looking for a change of scenery, check out Loco Panda. The first to do when you get to the site is sign up. That’s a breeze—you just download the software and register a free account. If you’re not interested in downloading the software, or you run a Mac computer, you also have the option to create your account directly from the site and play from your browser (we recommend the download. It’s a small file that won’t bog down your pc, and it gives you access to Loco Panda’s complete game category; it’s the way to get the best gaming experience). There are over 150 casino games in the casino—over 100 slots—so you’ll definitely find something to play. Make sure to take advantage of the bonuses the casino offers. You can score a huge 400% bonus for slots on your first deposit—that’s worth up to $4,000 when maximized! The site definitely has that vibe of “no rules, just fun.” However, there are a few basic rules that you should know about. First, Loco Panda believes in responsible gaming. That means they don’t allow underage gaming (under 18). The other “rule” that you should keep in mind is that Loco Panda does have security measures in place (for the protection of their players). For complete details, you can always reach their customer support team, which is available 24/7 via live chat, email and toll-free telephone.